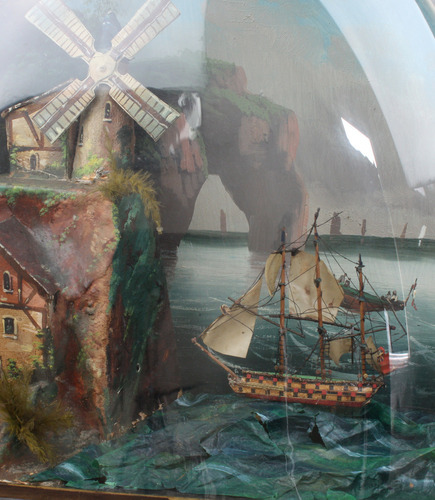 When the pull-string tabataire is wound, the tune selected and the start/stop pin actuated, the action begins at once, with the sails of the windmill perched upon rocky cliff rotating steadily, as the ship under full sail lisps back and forth upon the rough waves in the shadow of the distinctive Dorset coastline, coming to a halt when the tune finishes. The cylinder musical movement playing two popular airs, set to either automatic stop or continuous. 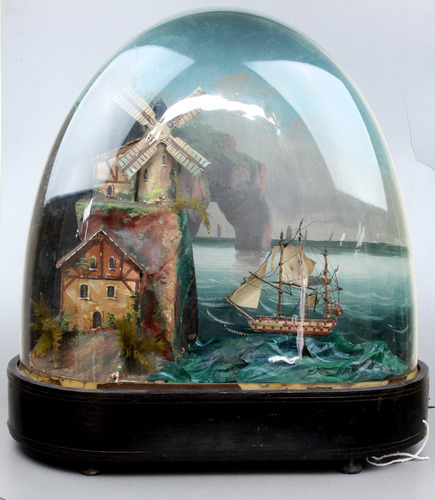 The three mast rigged ship with painted tinplate hull and body, delicate colour lithographed paper port and cannon holes, rough sea of coloured paper against the imposing rocky cliff-face with ridged roof dwelling at the foot, and smaller mill house at the top, circular tower and traditional slatted sails, coloured feather and silk fern groups, moulded and textured painted gesso papier-mâché body, all set off superbly against the internally half-painted glass dome studied with figures in a rowing boat, sailing vassals on the horizon, and the very famous landmark Durdle Door uniting all. On ebonised oval wooden base with twin double brass inset bands, on small bun feet. As one of the most recognisable natural features of the British coastline, Durdle Door is where land meets sea in the county of Dorset, not far from the equally impressive Needles and Chisel Beach. 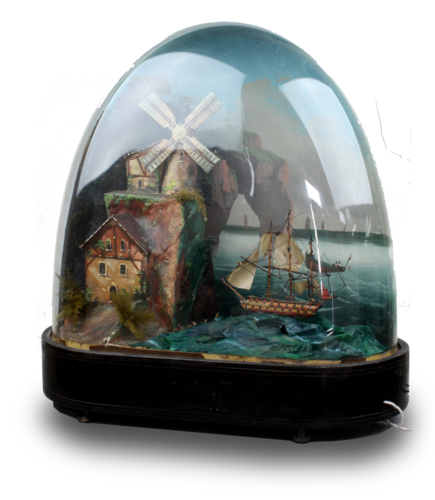 It is very interesting the maker used a true-to-life focus for the painted study, as usually it follows a particular theme with artistic licence on full speed - subjects such as whaling, shipwreck disaster or simply a small port town with the open sea beyond. 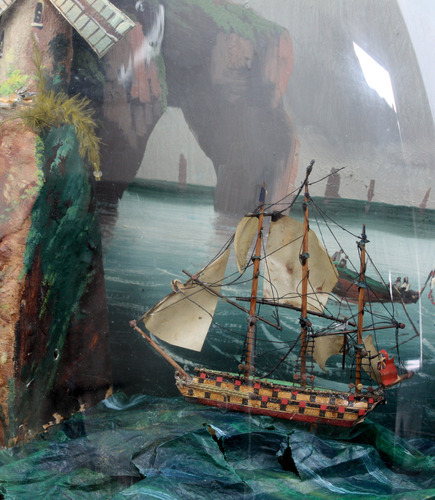 The ship is one of the most impressive and detailed examples yet handled. Tinplate being very thin yet strong and the close detail of superb resolution. 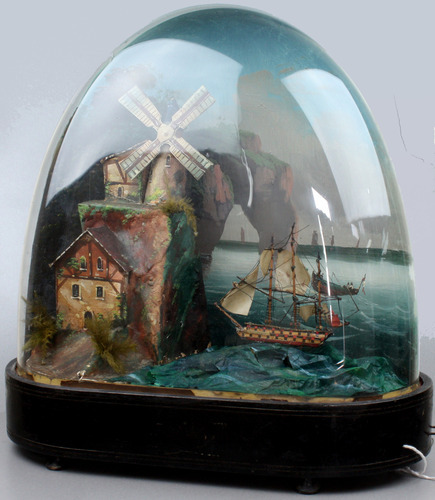 A very fine example of one of the most loved and adored musical automaton designs ever made.